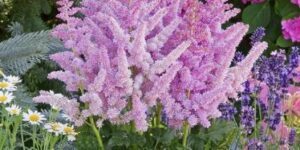 Fragrant Raspberry Plumes in Mid Summer The Astilbe ‘ Wisions’, Astilbe chinensis, is a colorful feathery flower with fragrant raspberry blooms and lacy blue-green foliage. The flowers contrast wonderfully with the glossy foliage. 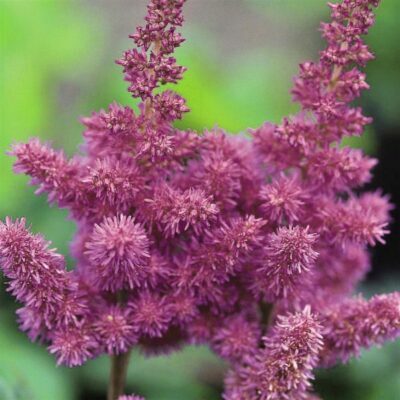 Astilbe ‘ Wisions’ blooms in July and is 15 ” tall and has a plant width of 12-18 ” . 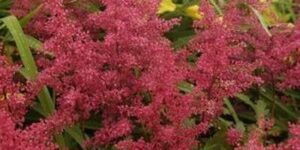 It is more sun tolerant, but is most successfully grown in a shady area. 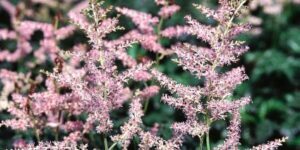 Do not allow Astilbe ‘ Wisions’ to dry out since it prefers moist, humusy, organically rich soils. It is most successfully grown in a shady area, but can tolerate some morning sun. 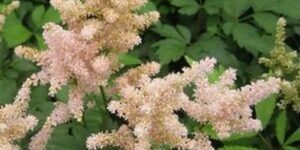 This Astilbe is more tolerant of dry soil than other Astilbes. A moist, well-drained area is a key feature for growing a healthy plant. 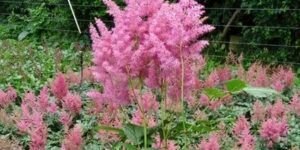 Astilbe is considered to be diesease, deer and rabbit resistant and will attract hummingbirds and butterflies. 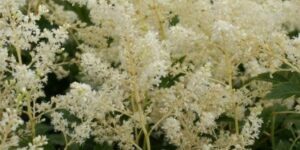 ‘ Wisions’ Astilbe can be used as cut flowers to make grand bouquets. 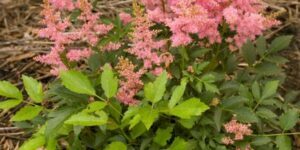 Plant this showy perennial for beautiful summer color in shady areas. 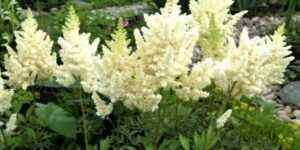 You will be delighted to see how this plant forms a graceful perennial border, or add to shade gardens with hostas and ferns!